Barbara Kruger re-makes signs. Unlike the bulk of signage we see every day, Kruger's work tries not to deceive us into believing we have a need to fulfill, but to allow us to discover the deception of signs. As far as a classification of her medium, Kruger is considered a montage artist. But, as Kate Linker, who wrote the text for Love for Sale: The Art and Words of Barbara Kruger, puts it, her pieces "resist the smooth coherence associated with that genre (Love, 12)." Kruger makes visible the breakdown of metanarrative structures, the decentered nature of contemporary culture, the struggle between sign and signifier, the hyper-consumerism of the late 20th century, the commodification of the sign, and involves her viewers in the universal flow of power. She reapportions the power of cultural iconography and commercial images, robbing the slick conveyances of societal assimilation of their strength and giving it to her audience in the form of knowledge. Kruger has forged her career from the saddle and tack of late capitalist consumerism. Her key influences are "movies, television, and the stereotypical situations of everyday life (Love, 12)." From blue collar, New Jersey roots, she has built a successful career in a whole spectrum of disciplines. The key to understanding Kruger lies in considering the place of the sign in society. Kruger's work can be found in all of the realms where signs dominate: book covers, posters, billboards, T-shirts, and matchbooks. In addition to all of this different design work, Kruger writes two columns for Art Forum magazine, one analyzing film and the other analyzing television. She is a prolific writer, editor and lecturer, and has organized many shows and events. She is a quintessentially postmodern artist. After graduating from Syracuse University, she enrolled in Parsons School of Design in 1965. Shortly after coming to Parson's, she was given a job at Mademoiselle, and within a year was chief designer. Her design experience would factor heavily into the work she began doing as an artist in 1969. Throughout this time she was tuned into the ideas being bandied about by the postmodernists. She incorporates the ideas of a wavering master narrative, a decentered culture, the notions of simulation and simulacra, consumerism and the commodification of the sign, and the fluid nature of power. All of these elements work together in her art to reject conformity and interfere with the cultural stigmas and stereotypes we are bombarded with every day. A popular topic of postmodern theory is the breakdown of the metanarrative. In "The Postmodern Condition: A Report on Knowledge," Jean-Francois Lyotard defines postmodernism "as incredulity toward metanarratives (Postmodern Condition, 71)." The overarching story of how the world fits together no longer satisfactorily explains the world we live in. This concept leads postmodernism to rely on individual micronarratives to order our world. Jacques Derrida's ideas about a rupture and the decentering of the world, as explained in "Structure, Sign, and Play in the Discourse of the Human Sciences," fit right into this idea that the grand scheme has failed to tell us anything useful. Derrida states that "the center has no locus" and that anything that resembles a center is just the intersection of various signs (Structure, 225). Both of these concepts are at work in Kruger's pieces. Kruger has a work entitled "Your comfort is my silence." As long as the ethereal "you" doesn't hear "my" micronarrative, your worldview remains intact. The use of the pronouns serve to decenter the viewer's position. The viewer is shaken because the natural reaction to the piece is that the "you" does not refer the viewer in particular, but to some otherness that is not viewing the picture at the moment. The viewer reacts by stepping out of s/he/its normal frame of reference to evaluate the picture, thereby forming s/he/its own micronarrative of what the image is referring to. Kruger also uses the feminist micronarrative often. She brings this to the foreground in many of her works, and pulls in the alternate, female, perspective of the world. Lyotard mentions that, "Narrative function is losing its functors, its great hero, its great dangers, its great voyages (Postmodern Condition, 72)." Kruger backs this up with her piece, "We don't need another hero," which features a Norman Rockwell image from a Saturday Evening Post issue of a woman (or girl) admiring the bicep of a boy. But Kruger is aware that a rupture is necessary to get viewers to begin constructing their personal micronarratives. In order to achieve this, Kruger shows her art in a multitude of forms and modifies it to fit with the medium through which people will experience the work. Imagine the effect of putting images featuring slogans like "Surveillance is your busywork" on signs on a subway car in New York City. Now juxtapose this with the exact same image shown in Sydney with the phrase changed to "Surveillance is their busywork." Kruger knows that people not intricately involved in the system of global Americanization are not those that she is railing against. She adjusts her art to communicate in the best possible way with her viewers. Kruger's pieces are insidious, popping up in odd places and camouflaged as everyday signage, but designed to force those who experience them to skip track and end up on a different course than they were the moment before. The postmodern notion is that most of what is presented to us through various forms of media has little to do with reality. Possibly nothing at all to do with reality. The image begins by representing some real-world object or idea, a "basic reality" in Baudrillard's words, then masks whatever it was representing before. This progresses until the image masks the absence of whatever it was representing, and then until finally the image has nothing whatsoever to do with reality. In this final stage the simulacrum is created (Precession, 346-7). The simulacra build upon each other to create a hyperreality: a reality that is purely intellectual and bears no resemblance to the real physical world. The hyperreality in turn churns out more simulacra, completing a cycle of creation and destruction that bears no relevance or relation to any reality. This hyperreality is readily apparent in all forms of communication (i.e. television, film, radio, theater, literature as well as the various sub-categories such as network news, newspapers, magazines and straight-to-video movies) as a distorted reflection of real life. Baudrillard describes this as "substituting signs of the real for the real itself (Precession, 343)." Kruger reflects Baudrillard's theories exquisitely. She describes her focus as "the panorama of social relations (Love, 29)." She is concerned with revealing that the social ideals we hold about beauty, self-identity and consciousness are mere simulacra. It is not that we are not capable enough, but that the signs we're holding up to each other are unattainable. Kruger's image of a woman looking into a broken mirror with the words "You are not yourself" is a good example of her work's dialogue with Baudrillard's ideas. This image is suggestive of the distance between the simulacrum and reality: You are not yourself because what society tells you to be is impossible. The concept of self-identity in our culture has been turned into a simulacrum, and is therefore irrelevant to real life. This piece also highlights another connection between Kruger and Baudrillard: They are both fascinated by the eye, sight, gaze. 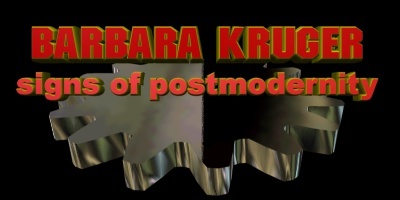 In Kruger's work, this can be misassociated and relegated to another facet of her feminist stance, but it has as much if not more to do with her fascination with Baudrillard's theories, which have often been explained/described in terms of mirrors of reality and distortions. The image is theoretically a mirror of society, but has been distorted into a simulacrum. Kruger's art formalistically plays with the idea of simulacra as well. It fronts like it is simply another sign: another simulacrum misrepresenting reality to us all. What prevents Kruger's work from being just another simulacrum is the text. She adds words that "intercept the stunned silence of the image with the uncouth impertinences and uncool embarrassments of language (Love, 29)." It is through this juxtaposition that she brings her art above the realm of ordinary signage. The fact that many of her words and images are appropriated from other places also helps nail down the purpose/truthfulness of the images. For example, the "We don't need another hero" piece that was mentioned earlier succeeds on all of these levels. Both the text and the image are appropriated, but by blatantly flaunting this, she causes the viewer to think about the cultural baggage going along with the piece. Both Kruger and Baudrillard also discuss consumption and commodification in their work. Baudrillard states, "Today consumption...defines precisely the stage where the commodity is immediately produced as a sign, as a sign value, and where signs (culture) are produced as commodities (Love, 73)." Baudrillard takes the sign to another level, saying that it represents the culture as a whole. Kruger brings her trademark with/cutting edge to this discussion in a piece, "When I hear the word culture I take out my checkbook." This is a restatement of Baudrillard's discussion of the simulacra and hyperreality, but contextualized in an economic situation. Jameson's concept is furthered by Baudrillard's additional explanation: consumption is no longer dictated by any need or even by "real objects as sources of satisfaction (Love, 73)." In looking at people such as Andy Warhol and Jeff Koons, Kruger realized that contemporary artists were selling simulacra of culture, artistic enterprise and class distinction. In signs like "Buy me, I'll change your life" and "I shop therefore I am" Kruger works these theories through real world scenarios. The advertisements are really saying "Buy me, I'll change your life" to us, and what we're being sold is not real-world products but simulacra like "the societal construct of a happy life" and, in "I shop therefore I am," it harkens to signs selling simulacra like "the societal construct of self-identity." The former may be something as seemingly benign as an appliance commercial, the latter something like a department store ad campaign. Both are also participating in the commodification of the sign. The power of icons in our culture is considerable, and Kruger has tapped into this: "the cool hum of power [resides] not in hot expulsion of verbiage, but in the elegantly mute thrall of sign language (Love, 29)." This statement can be supported by the long fascination of humanity with pictures and art, the potential for images to arouse emotions and spark imaginations, and the equitability of art with intelligence and prominence in our culture. Looking at people like Andy Warhol and Jeff Koons, Kruger realized that contemporary artists were selling simulacra of culture, artistic enterprise and class distinction. Her epiphany is apparent in the piece "When I hear the word culture I take out my checkbook." This picture is a grotesque close-up of, fittingly, a ventriloquist's dummy, and in a much smaller text box hidden in the corner of the image is the phrase "We mouth your words." The parallel between the image and the latter phrase is obvious, but what about the main phrase about culture, which is obviously more foregrounded compositionally. Knowledge of Kruger's design proficiency negates explaining it as simply a red herring. The intent is to imply some relationship between the commodification of culture, which is really a simulacrum anyway, and control. The relationship is a postmodern one, expounded by theorists like Baudrillard and Jameson. But her message is also informed by Marxist theory. The ideas of the society are handed down from the ideology of the ruling class (German, 173). Kruger disarms by subtly implying a long history of intellectual, political, economic and class antagonism. Kruger is one of many postmodernists whose ideas are influenced by Marx. Michel Foucault, in The History of Sexuality: Volume I: An Introduction, expounds a theory that forms the basis for most of Kruger's ideas about power. Foucault determined: "Power is everywhere; not because it embraces everything, but because it comes from everywhere (History, 334)." In Foucault's theory, power is not a quantifiable and/or containable concept, it "is not an institution ... it is the name that one attributes to a complex strategical situation in a particular society (History, 334)." Power basically flows continually, and we are constantly in the process, or at least at risk of becoming involved in the process, of going from powerful to powerless and vice versa. Power struggles occur all the time, and manifest themselves in all kinds of relations including economic processes, knowledge relations, and sexual relations (History, 334). Power is constantly in flux because, as Foucault writes, "Where there is power there is resistance (History, 336)." This decentering at once grabs the attention of the viewer and encourages and allows for the viewer to engage with the work on s/he/its own terms, and thereby allows also for power to flow. Kruger works to enhance this redistribution of power, and sometimes changes the piece to fit a different audience. For example, the piece "Your manias become science" features a mushroom cloud, and has an obvious connection to the destructive nature of control. It remains the same piece when it is put on the back of matchbooks. However, when she exhibits it outside of America it may change. In Mexico City and Sydney it reads, "Their manias become science." Although power is diffuse and anonymous, it is not impossible to realize who is not in power, and Kruger does not aim to alienate her viewers. Rather she wishes to allow them to realize their alienation. This most certainly speaks to a marxist concept that alienated individuals are not necessarily aware of their alienation (Grundrisse, 293). By initiating this power flow, Kruger has also fulfilled another marxist ideal. Artists throughout history have interpreted the world, "the point, however, is to change it (Theses, 145)." Baudrillard, Jean. "The Precession of Simulacra." Hutcheon and Natoli 342-75. Derrida, Jacques. "Structure, Sign, and Play in the Discouse of the Human Sciences." Hutcheon and Natoli 223-43. Hutcheon, Linda, and Natoli, Joseph, eds. A Postmodern Reader. New York: SUNY, 1993. Marx, Karl. "Theses on Feuerbach." Tucker 143-5. Marx, Karl. "The German Ideology: Part One." Tucker 146-200. Marx, Karl. "The Grundrisse." Tucker 221-93. Miers, Charles, ed. Love For Sale: The Words and Pictures of Barbara Kruger / text by Kate Linker. Japan: Harry N.
Tucker, Robert C., ed. The Marx-Engles Reader. New York: W.W. Norton & Company, Inc., 1978.